Founded by pro skater Jamie Thomas in the mid 90s, Zero is one of the heaviest-hitting brands in skateboarding. Zero has released seven skate videos, each gnarlier than the previous. 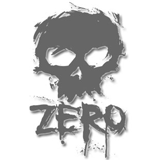 The Zero team has also won three consecutive Thrasher Magazine 'King of the Road' competitions. Zero boards are a classic shape, in quality 7 ply, with deathly graphic designs.